[118 Pages Report] The global compound management market is projected to reach USD 424.5 million in 2023 from USD 188.0 million in 2017, at CAGR of 14.5%. The base year considered for the study is 2017, and the forecast for the market size is provided for the period between 2018 and 2023. In the current market scenario, the growth of the market can be attributed to the increasing drug discovery activities, growing biopharmaceutical industry, and rising trend in outsourcing compound/sample management. On the other hand, the large capital investments needed to establish compound management facilities is the major factor restraining market growth. Rising R&D expenditure globally has driven the pace of drug discovery. Most major players in the pharmaceutical industry have committed substantial investments to R&D to fulfill the demand for more effective drugs and therapies, which has proven beneficial to the compound/sample management market. Additionally, the demand for automated compound/sample management is expected to gain momentum in the coming years due to the growing government funding for biotech and drug discovery research worldwide. Biopharmaceuticals form the fastest-growing segment of the pharmaceutical industry. The growth of this sector will also support that of the sample management market, as increased biologic production will spur the demand for sample management. 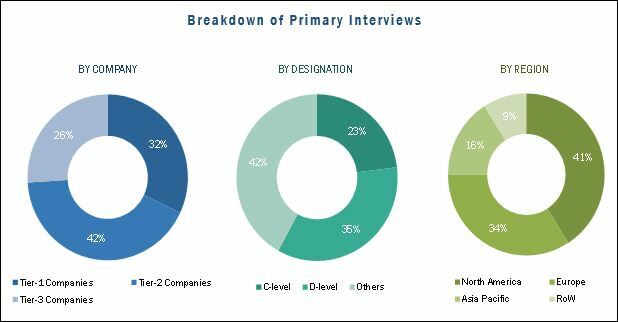 The growth of the biopharmaceuticals market is attributed to the increasing demand for biologics, the emergence of biosimilars, and increasing R&D expenditure in biopharmaceutical companies, as well as the increasing prevalence of chronic diseases. Top-down and bottom-up approaches were used to validate the size of the global compound management market and estimate the size of various other dependent submarkets. Major players in the market were identified through secondary research and their market presence was studied through primary and secondary research. Secondary research included the study of the annual and financial reports of top market players, white papers, medical journals, certified publications, articles from recognized authors, directories, and databases such as Statista, World Health Organization (WHO), Organisation for Economic Co-operation and Development (OECD), Centers for Disease Control and Prevention (CDC), International Cytokine and Interferon Society (ICIS), Diagnostic Marketing Association, American Clinical Laboratory Association (ACLA), and National Health Service (NHS), whereas primary research included extensive interviews with key opinion leaders such as CEOs, directors, and marketing executives. The percentage splits, shares, and breakdowns of the segments were determined using secondary sources and verified through primary sources. This data is consolidated and added to detailed inputs and analysis from MarketsandMarkets and presented in this report. 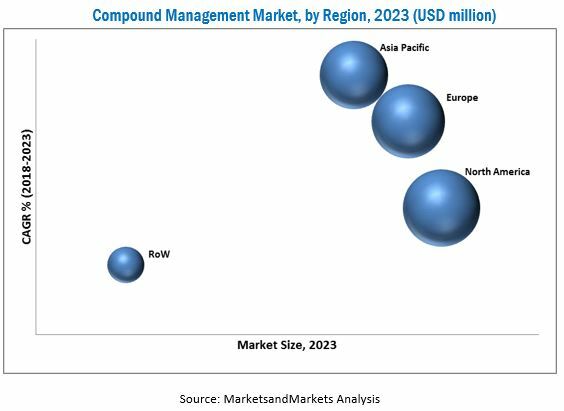 The key players operating in the compound management market are Brooks Life Sciences (US), Tecan (Switzerland), Hamilton Company (US), TTP Group (UK), Labcyte (US), and Biosero (US). Brooks Automation acquired BioSpeciMan Corporation to expand its consumer base, sample management services offering, and geographic footprint. Brooks Automation acquired 4titude to expand its life sciences products portfolio and to gain its 1200 global customer base from the pharma, biotech, academic, and biobanking markets. Brooks Automation partnered with the Cleveland Clinic to open a new biobanking facility for Cleveland Clinic by utilizing Brooks’ sample storage solutions. Tecan collaborated with DiaSorin to deploy its Tecan's Fluent Laboratory Automation Solution into its nucleic acid extraction platform. Biosero completed the expansion of its new facility and relocated headquarters, their corporate office, R&D center, and production facilities in San Diego, CA (US). Hamilton unveiled its new subsidiary in Malans (Switzerland)–Hamilton Storage GmbH to cater to customers in Europe, the Middle East, Africa, and Asia. The global compound management market is projected to reach USD 424.5 million in 2023 from USD 215.3 million in 2018, at CAGR of 14.5%. Increasing drug discovery activities, growing biopharmaceutical industry, and rising trend in outsourcing compound/sample management are the factors supporting the growth of this market. On the other hand, the large capital investments needed to establish compound management facilities is the major factor limiting market growth. In this report, the market has been classified based on product & service, sample type, and end user. Based on product and service, the compound management market is segmented into product (instruments and software) & outsourcing services. In 2018, the products segment is expected to account for the largest share of the market. The outsourcing service segment is projected to grow at the highest rate during the forecast period. This high growth is attributed to the shift in trend towards outsourcing compound management to third-party service providers. On the basis of sample type, the global compound management market is divided into chemical compounds and biosamples. In 2018, the chemical compounds segment is expected to account for the largest share of the global compound management market. The large share can be attributed to the high cost of large automated storage systems. On the basis of end user, the global compound management products market is divided into pharmaceutical companies, biopharmaceutical companies, contract research organizations (CROs), biobanks, and other end users. In 2018, the pharmaceutical companies segment is expected to account for the largest share of the global compound management products market. The rising drug discovery activity is leading to an increased demand for compounds which is positively affecting the market growth. In 2018, North America is expected to account for the largest share of the global compound management market. The large share of North America is attributed to the presence of the large pharmaceutical and biopharma industry. As a result, several companies in North America are engaged in drug discovery activities, which require maintenance of huge chemical libraries. Moreover, to maintain the productivity of such innovative drugs and biologics, most of the leading pharma and biopharma companies have started building compound management facilities. One of the major factors restraining market growth is the high capital investments required to build a compound/sample management facility, including investment in both hardware and software, such as the installation of new automated liquid compound storage systems linked to a powerful inventory database. Due to this requirements, setting up such facilities may put them out of reach for small or medium-size pharmaceutical companies. Research institutes with limited budgets also find it difficult to afford such instruments. However, growth in the services market may alleviate problems of high capital investment. Key players that provide compound management systems are Brooks Life Sciences (US), Hamilton Company (US), TTP Group (US), Labcyte (US), Biosero (US), and Tecan (Switzerland). Companies that provide compound management services include Evotec (Germany), Wuxi AppTec (China), Icagen (US), TCG Lifescience (India), and Frontier Scientific (US). These players focus on both organic and inorganic growth strategies such as product launches, partnerships, and agreements to maintain and enhance their market share in the compound management market.